Billy has an Ax for Overpoliticking. Click here for the full-size comic strip. Click here to see the full size comic strip! Click here to see the full-size wishful violence--I MEAN--the full-size web comic! For #ThrowBackThursday: Billy Ballpoint celebrates July 4th in style! Click here for the full-size web comic! There is a level of appropriateness and illogic to how we celebrate Independence Day here in the US. Labels: 4th of July, America, Ballpoint Adventures 1999, Ballpoint Adventures Classic, fireworks, Independence Day, July 4th, murica! Billy and Barbie Ballpoint have a new TV show about the NRA! Click here for the full-size web comic. Click here to see the full-size web comic! Ah, the good old days, when cartoon extreme violence was still fun and ironic and not all-too-reflective of reality. I miss those days. 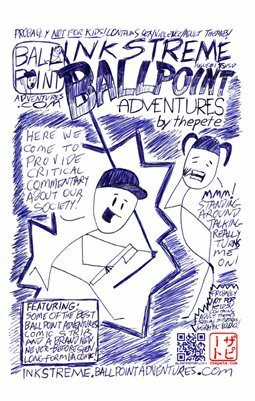 Billy and Barbie Ballpoint put out a plea for thepete's Patreon! patreon.thepete.com Even a buck helps! They Patreon link once again is: patreon.thepete.com! But I bet you're wondering what the story behind this strip is. The real story may surprise you!